About a month ago I had purchased what I thought was a large amount of thickly sliced bacon. Tonight I decided to finally use it. When I opened the package I discovered that it was, in fact, very thickly sliced bacon. In other words it was just one 3" slab of bacon. I had intended to take a few strips to render for tonight's dinner but instead I hacked it up into large cubes which, when dealing with bacon, is even more preferable. As I tried to figure out what to make for dinner I poured myself this Pollenator from Long Trail Brewing Co. 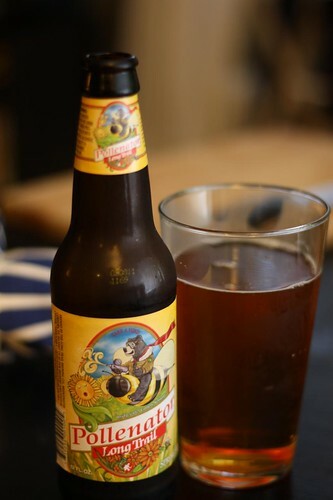 When I saw the label depicting a bear riding a giant bee I thought that this beer was a no brainer. I'm not quite sure how the sunflower on the label could nap while this bear was flying around wreaking havoc on what appears to by an idyllic flower garden. My friends with allergies may find this beer a bit of a turn off. Indeed I felt my nose tingle a little at the yellow label but as I looked at the bear who was spraying what appeared to be DDT it occurred to me that those flowers were not sleeping. Those flowers were dead! After coming to terms with what the bear had done I began rendering the bacon with some olive oil and butter. After it had crisped up I tossed in some diced onion, celery, garlic cloves, and sweet potato. Once that had stewed down I added some lentils I'd cooked and a bottle of the Pollenator and allowed this mixture to braise. I seasoned it up with some smoked paprika, cumin, salt, pepper, and a dash of hot sauce. Right before serving I tossed it with some fresh spinach. 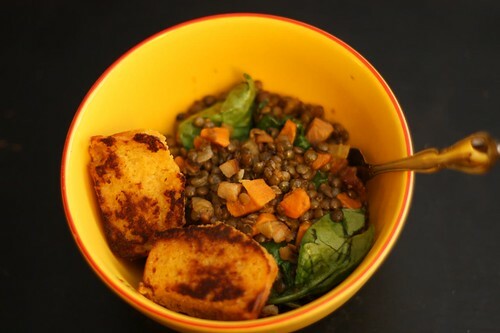 The result was a very nice hot lentil dish on a cold rainy night. Still, as comforting as this meal was it was hard to get over what this bear had done. Then I finally realized something. This is why the bees are dying!